Dean W. Armstrong: Why toolboxes and tool handles stink. Thank you so much for the info. We've been so puzzled by our stinky tool box. Your article is well written as well, btw. Thanks. It took me a long time to check this out on the web, because I was certain it was something we did. I thought someone had spilled some toxic substance on the tools, or used them to mix something smelly. I had only just figured out, through the process of elimination, that it was the plastic handled screwdrivers. What in the hell!!?? We can put a man on the moon, etc. etc. Is this really necessary? Can we just get wood handles, or some other damn thing that doesn't smell, and let us get back to work without this LUNACY driving us crazy? Another ill effect of the space-age, let's get back to what we know works and won't hurt us, I don't need shiny objects, just tools that work and don't annoy. So, now that we have identified the culprit, how do we neutralize the smell? 4. I've read that if you convert butyric acid by neutralization via sodium bicarbonate into sodium butryate it becomes non-stinking. But I've not tried it. 1, 2, 3: separation, extra cleaning, sunlight, and perhaps sodium bicarbonate. Once I removed the smelly items I cleaned the toolbox with a variety of cleaners to reduce the smell, but it really was the removal and sealing of the decomposing tool handles that stopped and started reducing the smell factor. In the toolbox I tried Boraxo. Meh. I tried spraying a metal tool with an old can of Gumout. It smells too strongly. so I wiped all the non-plastic tools with some Liquid Wrench (mind you, these are just some old things hanging around, and hence free). I will try the sodium bicarb on the plastic handles. For now, I have wrapped the stinking tools in cloth and no longer store them in the old place. In fact, I wonder if I simply store them in an open basket, wrapped in cloth, they would stink less. I have the same issue with an old "coin Dealer" Briefcase, it holds 4 custom plastic trays which display coins under a clear plexi-glass cover which reek like vomit. It was made in the 80's and for a coin dealer to transport several trays of coins to a show. I'd like to use the trays, as they are great for displaying coins, and was thinking of coating with some type of paint or sealer to make them airtight. I read on another forum someone suggested Armor-all. I'm soaking them in my kitchen sink now in white vinegar and water and it seems to be working a little bit. Old pinball platic parts from the 70-80's stinks the same! Bally and Gottlieb and possible Williams....I have a large box of replacement plastics for these pinballs and the bad odour of vomit reaches my nose every time I come near it! :( And I also have a set of Xcelite screwdrivers from 1985 (!) which still stinks to high heaven! (and always have) I have them in a small toolbox and everytime I open it I'm about to p*ke myself...gah! I took mine back to Sears. they were replaced even though they were twenty years old. I noticed some older tools in an unused box smelling. I like the older tool. They were still around after others got broken, lost or stolen--ahem...borrowed and forgotten. I think it is called desiccant and as long as you remember not to eat it they last a really long time. I don't know if my chemistry is correct, but I figured I could oxidize the butyric acid with something. So, I tried soaking in Oxyclean detergent/ stain remover for a couple of days. It seems to have worked, so far. I'll see how long it takes to come back. I used the powder that has some blue crystals in it. It also works for removing moss from our north facing asphalt roof. I also used it to get rid of the similar stink from old polyurethane waterproofing on fabric. This is VERY useful, and I'll probably have to replace all the tools I have with CAB, but when I go to buy new ones on amazon, I have no clue how to find ones without CAB. Looks like Craftsman brand is infamous for this problem--any recommendations for non-stinky brands? I'll have to give Anonymous' oxyclean idea a try. A little worried about leaving the metal tools in water for several days. Won't they rust? That's a good question, as I've never seen handles described beyond "durable" and 'easy grip". Every CAB handle I've seen is either transparent with a dye color, or transparent with 50% painted. Klein Tools describes their handles as "tough plastic", which could mean anything, but they look just like other CAB (and they used it in the past). I have what I suspect is a CAB screwdriver at work, but it was purchased new and is probably about 10 years old, and does not smell. Some CAB handles from the early nineties do smell, and I suspect if you bought new CAB handles now, you would have some time before they degraded, especially if kept in a cooler environment. The Oxyclean thing I would hazard might be the conversion into a butyrate salt, as it is a basic solution, however I now see that sodium butyrate is listed as having "an unpleasant smell". Keeping the metal out of the solution would be the way to go, perhaps keeping them vertical in the solution. Did the clear lacquer take care of the smell? I was thinking about dipping mine in polyurethane. CAB has not been used in tool handles since the 80s All the manufacturers are aware of the problem and stopped using it. My question is what is the best topcoat.I recently cleaned up a whole bunch of Xcelite nut and screw drivers. Shellac is neither water proof, alcohol resistant or durable. I have heard clear nail polish advocated but that is lacquer, another less than durable product. I have to be careful not to use something that dissolves CAB. Moisture cured or catylized polyurethane is what i have been toying with, though the single part stuff might be enough. I know the exact distinct smell you are describing, and I have no problem understanding why it may be offensive to many people, but I am glad it does not offend me. Personally, it's more nostalgic to me, reminds me of my father's tools, so I don't feel the need to mask it from my own tools that now have that particular scent. I only have a few tools with CAB from my father so my toolbox is not bad. My toolbox at work however smells like nothing else which is full of old Xcelite sets past on from others. I was thinking you could use a spray epoxy but then it would react with acetone. I think the best choice is product called plastic- dip which is a latex base product that forms a rubberized handle on the tool. If you have a latex allergy, you should try something else. If my box gets intolerable, I will use the plastic-dip since It should improve the grip of the handles. I worked as an aircraft mechanic for a few months before changing my field to computers. I still have my old tool box, with many of the aircraft tools from 1997, and it's been smelling for as far as I can remember. I always wrongly guessed that the smell is from some decaying lubricant used on aircraft parts. Or worse, a spill over of waste/toilet water that had splashed all over the hangar floor one time and my toolbox was not too far away from it....yukh... Anyways, thanks for this article. Now I know what that stink is. This finally answered my question about the vomit smell coming from my toolbox! I couldn't figure it out (I suspected this cheap plastic toolbox I was using was the culprit). There is also a white slimy coating that looks like mold. Sodium Bicarb and a stiff brush kills smell and coating. I need a fix to stop recurrence. I do not want to cover the color or size info. on the handles. I have cleaned them before. It comes back. Is the Sodium bicarbonate dry, paste or solution? I still have an old toolbox from the telephone company after I left that job in the 60's. 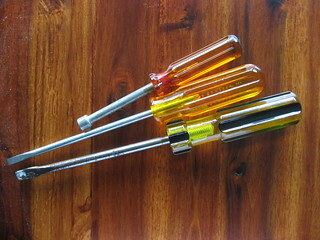 I have many of the original hand tools, side-cutters, diagonals, long nose & screwdrivers. Well, even after more than 50 years, the screwdriver handles still have that odor and , as you had mentioned, will contaminate anything else they are near. Fortunately or unfortunately, after purchasing many excellent screwdrivers over the years, none are as good as these and that's why I still have them around, their handles are the largest handles made for tools that size and allow one to get an extraordinary grip on them (mfg by Bridgeport Tools). Thanks for the tip on the decontamination! I have been wondering about this vomit smell for several years. I finally decided to look it up on the internet & lucky for me I found your blog. Thanks to everybody for the input. I've been complaining to my husband about this odor for ages! I finally cleaned out the box...washed it and aired everything out in the sun only to find it didn't help one bit! Why not just put baking soda in a container with holes or charcoal or a car deodorizer in the box with the smelly tools? wouldn't that help?... rather than moving nasty smelly tools to another location? I'm trying charcoal today and hoping for a change in the odor! This is proof of the benefits of the internet! Thanks for great info. I am so glad and relieved to read the comments. I do own "home-maintenance" in UK. The scary smell induced a paranoia. Like one of your other contributors, I crazily suspected a workman (who placed few boards into garage) of deliberately dropping a toxic substance into my previously clean tool-box. The smell is like evil chemical pickles. The odour compelled me (after cleaning out the tool box yet again) to give immediately a large random selection of my tools to a relative (before knowing it affects only those with acetate-type handles). It seemed to have arisen during the time since I commenced storing large tool box at floor level in damp cold garage. The miniature acetate ones (older? )kept in an indoors toolbox are not affected yet. Could toxic substance pass into body via skin? Please pass on our experiences to the tool manufacturers so that more perfect handle material can be developed. [The smaller hand size of females also must be considered more, to stop us ending up with finger arthritis (prevents us from texting!)]. Thanks to whoever started this, I really hope you get this and continue and to all who contributed. I just through away a really nice big plastic tool box because of the barf smell. I’ve put my screwdrivers thru the dishwasher and they still stink. I suspect from being in the hot garage the gases have been cooked right out. So I will try the ideas or I’ll take them back to Sears! Thanks again. Thank you for this post! We were about to throw out our toolbox, thinking it must be mold causing the smell, when I happened to find this. Now we've smelled all the screwdrivers and identified the culprits.